"Danger waits on both sides of the grave. With the mysterious disappearance of vampires, rumors abound that a species war is brewing. A zealot is inciting tensions between the vampires and ghouls, and if these two powerful groups clash, innocent mortals could become collateral damage. Now Cat and Bones are forced to seek help from a dangerous "ally"; the ghoul queen of New Orleans herself. But the price of her assistance may prove more treacherous than even the threat of a supernatural war . . . to say nothing of the repercussions Cat never imagined." You would think that after reading five of these books back to back I would be getting tired of them but nope, all I want to do is keep going. I love Cat and Bones and all of the secondary characters. I always knew I was going to enjoy this series but I never expected to be so consumed by it. Cat and Bones have made it so hard for me to get invested in other books because all I want to do is get back to this series. Cat continues to be awesome and she keeps getting more and more powerful. I love how she continues to grow and step up when needed. She doesn’t want to be powerful but she accepts that she has to step up and do what needs to be done. She is fierce and crazy powerful and a badass and I love it. I of course adore Bones. I am so obsessed with him its not even funny. Hands down my favorite vampire hero ever…. more so than Eric Northman or Shane, who previously held that title. Bones is just so easy to love. I love how much faith he has in Cat and how much he loves her and continually shows that. Their relationship is easily one of my favorite ever. I also REALLY loved the scene where Bones beats a ghoul with that ghouls own arm... I found it incredibly funny. 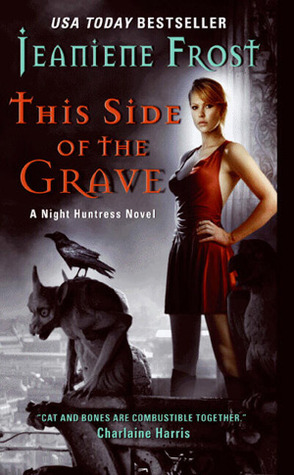 As with the other books in the series, This Side of the Grave is addictive. There is non stop action and danger and it keeps you hooked. I love how these books perfectly mix action, fun, romance, and the paranormal. I’m going to be devastated when I finally finish the series. All in all, This Side of the Grave is an awesome read. I adore this series and this book and these characters and I know they will stay with me for a long time. This does sound like an amazing series! I got the first book! Now, if I can find time to read it :) I love the sound of Cat, she sounds like an amazingly strong chick and Bones just sound flipping awesome! The characters sound great and like this is def worthwhile. I love it when a series captures you like this! Guess I need to get to this series. But I can't seem to keep from reading more of my own obsession. 25 Days of Book Boyfriends Blog Tour! 25 Days Of Book Boyfriends Blog Tour Sign Ups!